I am preparing a wine tasting for a wine club I form part of in September and the theme is Sicilian wines. I have therefore been researching a bit more than usual about the wine producers of Sicily and also tasting some more wines from this Southern Italian island which produces some stunning wines. This will hopefully be a new series for Food and Wine Gazette on wine producers in different wine regions and countries of the world who are worth looking out for because they produce consistently good wine. In part, this is also inspired by a conversation I had with a reader of this blog who asked how I go about purchasing wines I would be drinking. But that is another story. There are no secrets to buying or drinking great wine. It all boils down to knowing which are the wine producers that produce consistently good wines. A good indication of the quality of the wine is the entry level wine. It might not be stunning but if it is well made it will be enjoyable and you can rest assured that the rest of the wines in the portfolio are worth trying. Price is not even an indication of a great wine and this is important to know particularly as prices of wines in some regions are incredibly inflated. As a general rule, we will list winemakers which might not necessarily be the best of the region (that is a philosophical question about what constitutes the best wine and readers of Food and Wine Gazette know that we do not like the point system or classifications because they are subjective and misleading). We will point you to the ones which are not necessarily mass producing wines but which have a range of wines making it relatively easy to find (not supermarket wines but wines which you can find in many decent wine stores). For more about Sicily and its wines, you may want to read an earlier post we had written. The following are my list of 10 Sicilian winemakers to try. I have had to leave out many other wineries (some of which like Azienda Agricola Palari and Azienda Agricola Frank Cornelissen which are exceptional wineries but maybe harder to find). Benanti – Benanti is a winery producing wines from the volcanic region of Mount Etna. The winery is relatively new having been created in 1988 by Giuseppe Benanti who revived the family’s old passion that had started in the 1800. Benanti in the past experimented in other areas of Sicily (Pachino and Pantelleria) but is now a pure Etna producer working with grapes from three varieties, Carricante (white) and Nerello Mascalese and Nerello Cappuccio. I recently tried a Nerello Mascalese which was stunning. The winery is also famous for its white Pietramarina made from the Carricante grape variety. Even their entry level wines can give you an indication of the potential of the Etna region of Sicily. Ceuso – The early 1990s were the years of the great Sicilian enological revolution. They started in their ‘garage’ producing 6,000 bottles and now produce around 120,000 bottles which are exported to many countries. Their flagship wine in my view is Ceuso, a blend of Nero d’Avola, Cabernet Sauvignon and Merlot. However, both the Fastaia and their entry level Scurati are worth trying. COS – We have written about this natural wine maker and were quite impressed with their story so it is no wonder that they are listed here. The wines produced by Azienda Agricola COS are all exceptional and also different to other wines produced in Sicily. If you have to try a wine from this winehouse, the Pithos would be a good starting point. Cusumano – Cusumano is a relatively new winery which also emerged in the late 1990s. 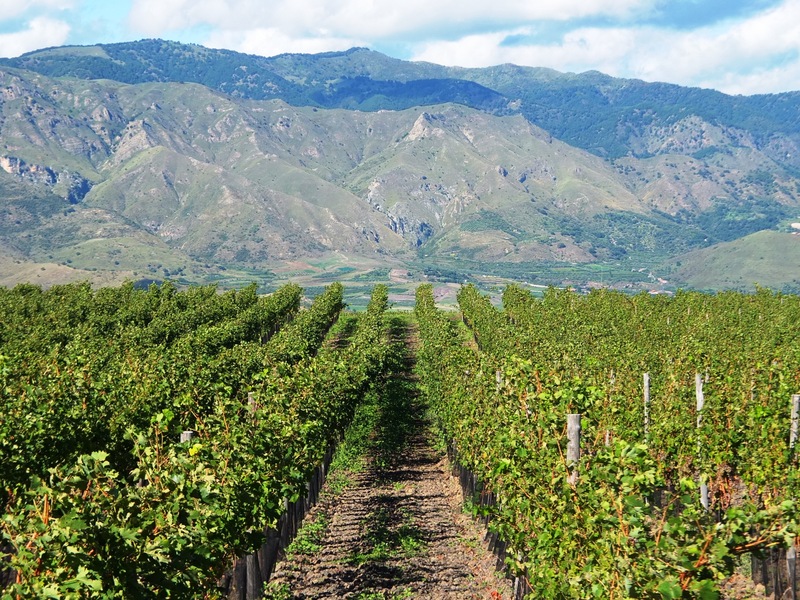 With vineyards across the whole of Sicily, they produce excellent wines from their entry level wines (watch out for their Insolia and Nero d’Avola) as well as their territorial wines. The Angimbe (a blend of Insolia and Chardonnay) and the Benuara (a blend of Nero d’Avola and Syrah) can be considered wines of excellent quality/price ratio while their top end wines are really worth trying. Donnafugata – The name of this winery is inspired by the most famous Sicilian book, il Gattopardo (the Leopard) which gave the name Donnafugata to the country estates of the Prince of Salina. From the entry level Anthilia and Sedara to the Tancredo, Mille e una notte and the Ben Rye, this is a very consistent winery. Firriato – The first time I tried a Firriato wine must have been over 15 years ago. It was a stunning Harmonium, a 100% Nero d’Avola. I had also tried the Camelot, a blend of Cabernet Sauvignon and Merlot. These are their premium wines and can be easily aged in the cellar. But even their entry level wines are interesting and worth looking out for. Morgante – When I discovered Morgante they were famous for their Don Antonio, a 100% Nero D’Avola which was a stunning wine. Their entry level wine, the Morgante Nero D’Avola was an excellent wine for its price. They are now making two more wines which I am not familiar with but which I will be trying in the coming months, a white wine made out of red grapes the Bianco di Morgante and another Nero d’Avola called Scinthili. Planeta – This is another Sicilian winery that started in the 1990s but one which has built a reputation as one of the best wineries of Sicily. It is now one of the largest wineries in Sicily making wines in five different locations from Menfi in Agrigento to the Etna in the North East part of Sicily. If you want to familarise yourself with Planeta wines you might want to start with the La Segreta (white and red). Their monovarietal wines are extremely well made and the winery has also invested in Etna wines. Also look out for their Cometa and Santa Cecilia. Tenuta Rapitala – I discovered this winery thanks to their stunning wine Hugonis a blend of Nero d’Avola and Cabernet Sauvignon. But over the years I have tried also their entry level wines as well as the Nuhar and Nadir. This is another Sicilian winery worth discovering. Tasca d’Almerita – This Sicilian family has been making wines for eight generations starting more than 200 years ago. Their most famous wine is probably the Rosso del Conte. The Regaleali in both white and red are also safe bets but this is another winery which produces great wines at every level.